Whether at home, business or in industry we all know that air conditioning, refrigeration, chillers and anything to do with managing comfort and temperatures can represent the biggest portion of energy use. In fact depending on the type of equipment you use, in some cases it can be as high as 70% of your total energy consumed. So it only makes sense to look at ways to reduce how much energy this equipment needs to use. If we were to use the example of home air conditioning, most people think that if they want to reduce energy in their reverse cycle air-conditioning the quick and easy way to do so is to adjust the set-point temperatures. For example make it warmer in the summer and colder in the winter. This is a quick and easy way to save on energy but there is one pitfall. YOU ARE SACRIFICING YOUR COMFORT! There is good news for those who want to save but also keep comfortable. 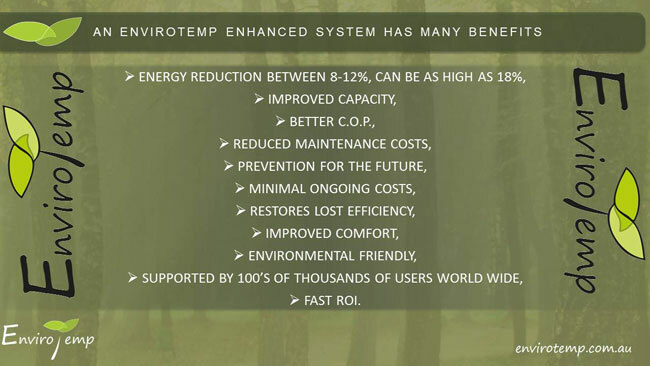 EnviroTemp is a unique oil-based energy solution that's added directly into the existing oil within the compressor motor, it does not replace the existing oil. Once installed, depending on the size of the unit, within moments it can begin to remove the stagnant layer of clogged oil and places it back into circulation where it should be. 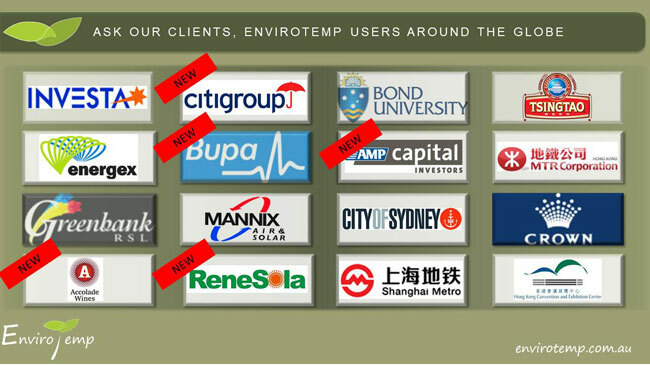 Once the layer of stagnant oil has been removed, EnviroTemp molecules will attach and imbed itself into the surface of the tubes which helps protect the system against future oil fouling. Your system can now produce better heat transfer, this translates into better temperatures from your vents. And because the temperature is better i.e. colder in summer mode and warmer in winter mode, your desired temperature for your room or home is reached sooner. Your system will no longer need to run as long as it did before, so you are saving on kilowatt hours and enjoying better comfort all at the same time. financing package for your solar investment.